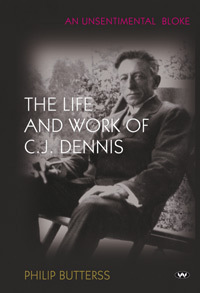 Congratulations to Philip Butterss, whose biography of CJ Dennis, An Unsentimental Bloke, won the National Biography Award of Australia on Monday. A battered old copy of CJ Dennis’s Sentimental Bloke sat on my family’s shelf when I was a child, and my unsuccessful efforts to read it immunised me against him, perhaps rather unfairly. By my quick assessment, this is only the second literary biography to have won the award since it started in 1996, the other being Jacqueline Kent’s biography of Beatrice Davis in 2002. (Some of the winners have, of course, been rather literary themselves, including the brilliant The Many Worlds of RH Mathews by Martin Thomas .) The award pits all kinds of life-writing against each other – not just different kinds of biographies, but memoirs and autobiographies, too. I feel it would make sense to create at least two categories; memoir is a very different genre to the researched biography. Can I say the memoir is easier to love and easier to impress with, and often takes less years to write? A generalisation, I realise. Good to see a book from one of the smaller publishers win – well done to Wakefield Press, who have been praised for the quality of the production. And now she hasn’t any. Good luck with your campaign for more rewards for biography research! That is a pretty bad poem! When was he working for the Herald? KSP was there 1908-1911, I think. The book only has cover notes and the poems themselves are undated. CJD died in 1938 (in 1952 “he still remains Australia’s most popular poet”) so he and KSP may well have crossed over. I agree wholeheartedly with you about the distinction between a memoir and a biography. Although they both involve shaping of material and events, a memoir rarely has to appeal to external verification in the same way that a biography does. I love the Sentimental Bloke, but never really jelled with The Glugs of Gosh (although as an adult, it may appeal more to me considering these political times). Looking forward to reading this Nathan. I think judging him with today’s eyes may be a little harsh, Australia was a very conservative country back then! It’s his children’s verse for me. Bright, bouncy, occasionally a little dark (even about the dark). I was away when you wrote this I believe, and have just been reminded of it as I’ve been tidying up my in-box. I agree with you too re memoirs – though I think we pit memoir more against autobiography than biography? Anyhow, I enjoyed this biography and it was great seeing Wakefield win the award too.